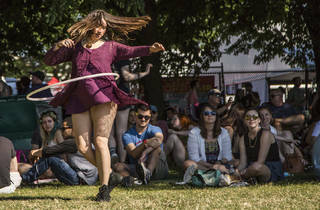 In addition to three days of live music in Union Park, Pitchfork Music Festival brings a barrage of events to the city to supplement the main event. We've already told you where you need to go to see Pitchfork aftershows, but you might also be interested in the various parties that are being thrown in conjunction with the festival this weekend. Take a look at some of the best after-parties where you can dance the night away after Pitchfork Music Festival shuts down. After recently coming out as transgender, LCD Soundsystem's Gavin Russom celebrates with a DJ set during this pre-Pitchfork bash held by LGBTQ-friendly Femme's Room. With a lineup of hosts that includes Lucy Stoole, Scott Cramer, The Salamander and Aunty Chan, expect this one to go late into the night. Berlin Nightclub, 954 W Belmont Ave. 10pm; $10. 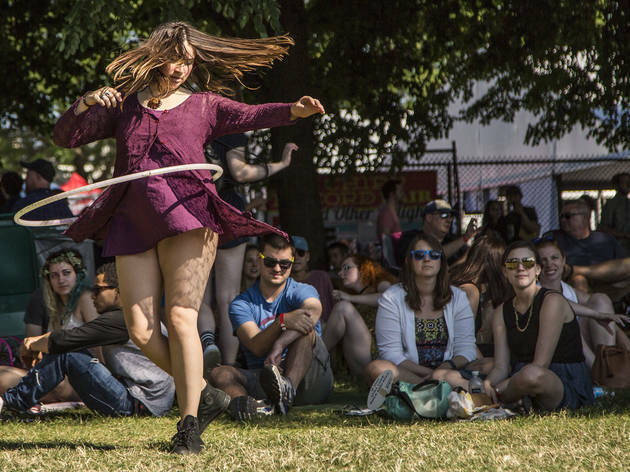 Each year, the Book Fort brings authors, readings and plenty of old-fashioned page-turners to Union Park, providing a place to relax when you're not seeing your favorite acts. This kick-off party at the Whistler will feature readings from Nat Baldwin (of the Dirty Projectors), Dan Ivec, Suman Chhabra and more before culminating with a dance party featuring DJ Sonny Mountain. The Whistler, 2421 N Milwaukee Ave. 7pm; free. While it's not officially associated with Pitchfork, the latest edition of this TED Talk-lampooning series is tackling an apt subject: festival season. Show up to see Sasha Geffen, Ty Howard and Mike Kinsella lead tipsy Powerpoint presentations that poke fun at our favorite summer gatherings—plus, all attendees get a free sample of Hopewell beer. Elastic Arts, 3429 W Diversey Ave #208. 8pm; $10. Chicago's Ace Hotel is celebrating its "preview period" (before its official opening in September) with a Pitchfork after-party organized by the folks behind Slo 'Mo. The event will feature a performance by LA artist and activist Madame Gandhi, as well as sets from Audio Jack and DJ Smiles Davis. Ace Hotel Chicago, 311 N Morgan St. 10pm; $15. The Virgin Hotel's first day of Pitchfork festivities kicks off with an afternoon DJ set from LCD Soundsystem's Nancy Whang (4:30–6pm). Once the festival lets out for the evening, Wild Belle's Elliot Bergman will DJ at Cerise from 10pm to midnight before handing the decks over to Chance the Rapper cohorts Joey Purp and Knox Fortune. Head to the 25th floor to catch live sets from Frankie Cosmos, Hoops and Divino Nino, beginning at 9pm. Virgin Hotels Chicago, 203 N Wabash Ave. Various times; free. The party continues at the Virgin Hotel on Saturday night, as Chicago-native Stefan Ponce and acclaimed DJ Madlib step behind the turntables at Cerise to spin some late-night tunes. Virgin Hotels Chicago, 203 N Wabash Ave. 9pm; free. Cap off the weekend by drinking Three Floyds beer and Dark Matter coffee while listening to tracks spun by Queen! DJ Michael Serafini from 2pm to close at Cerise. If you need some live music, Kilo Kish, Vagabon and Oddcouple will turn in sets in the small 25th floor performance space, beginning at 9pm. Virgin Hotels Chicago, 203 N Wabash Ave. 2pm; free.